The military has come a long way. Transforming from a male dominated field to an inclusive one. Years ago it would have been unheard of to have nursing rooms available to women on bases but now more and more are popping up. Leadership in many military locations are improving the way of life for families and female soldiers by creating nursing rooms to breastfeed and breast pump. 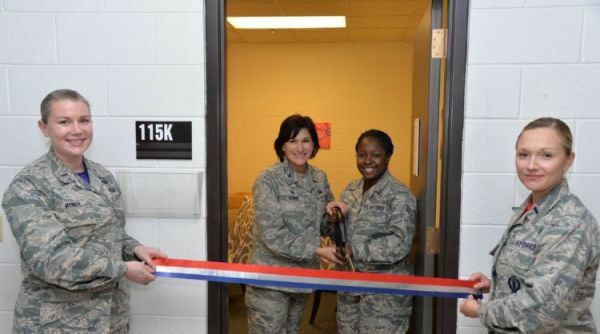 The most recent location, Malmstrom Airforce Base, in Great Falls, Montana, has opened 5 nursing room locations to accomodate families. First Lieutenants, Annabel Monroe and Sheila Koebel, realized women were using empty offices and storage to nurse or pump and decided to approach leadership with their concerns. Apparently the 341st Medical Group on base had 2 areas designated but they were hard to find, not many people knew about them and they were poorly lit. But after hearing the concerns of Annabel and Sheila, leadership fell in love with the idea of providing more space. By doing so they hoped it would make everyone happier and improve the quality of life on the base. The 5 rooms took some revamping but now include couches, great lighting, privacy, an outlet, rocking chairs and changing areas. “We want women to feel supported and hope the attention this is getting will help other moms to reach out and feel like they can have support and know part of the process and do this at their own base,” Koebel said.